It All Began in Monte Carlo by Elizabeth Adler, a Mysterious Review. Review: When searching for a fun summer "beach read," It All Began in Monte Carlo by Elizabeth Adler could fit the bill. This is the third Mac Reilly mystery. Mac is a Hollywood detective. He has his own television show and is dedicated to making other people's lives better. But, one person pays the price for his dedication, and his fiancé, Sunny Alvarez has decided it's a price she is no longer willing to pay. When Mac postpones their wedding once again, Sunny takes off her ring and lets Mac know that she's finished. Unbeknownst to him, she boards a plane for France on Christmas Eve and plans to leave him forever. When Mac comes home to find her missing, she suddenly becomes his most important case. But first he must figure out where she's gone! Sunny's escapade takes her across the Atlantic to Monte Carlo where she meets some of the most interesting and odd people imaginable. She spends Christmas with various people who see Sunny as a vulnerable woman who will be easy to be used for their personal gain. Sunny finds herself torn between a mysterious new love and her beloved Mac Reilly, and she seeks the help of her friend, Allie Ray - a movie star - who comes to Sunny's aid along with Prudence, an overweight divorcee who is also trying to find a new life. Once everyone congregates in Monte Carlo, mysterious things start happening. Mac is consumed with yet another vicious crime, Sunny and Allie are determined to give Pru a new look, and Kitty Ratte, one of Sunny's newest acquaintances sets her claws into an unassuming gentleman. All the while, Sunny gets the urge to show her independence by heading to Mumbai on a secret mission for the mysterious Maha Mondragon from India. Will Sunny and Mac ever be able to get through this latest mess and be together? If the goal is to read a light romantic mystery, then It All Began in Monte Carlo is the right book. It is generally light-hearted and does contain its fair share of romantic intrigue and mystery. However, if the goal is to read a book that will leave a lasting impression, then it might be best to look further. The characters in the book are not terribly interesting. Possibly the character development for Mac and Sunny existed in earlier books, so the lack of development here is understandable. However, characters like Kitty Ratte prove to be more annoying than interesting. Readers will find themselves getting angry at the other characters for even giving this overage, sexaholic a second glance. She manages to cause a great deal of trouble, but yet it is so unrealistic that these otherwise intelligent people would give her the time of day. Maha Mondragon, on the other hand, is a woman filled with intrigue, but yet her relationship to the jewel heist is obvious too early in the book. It's frustrating when the reader can piece together the puzzles faster than the detective. Prudence is possibly the most interesting character of them all. Her storyline is very minor, but yet it is the most memorable in the end. It is exciting to see her transform from this helpless soul to a confident woman who is able to help the handsome Eddie Johanssen out of a most horrific situation. 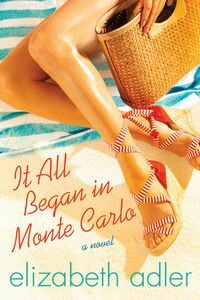 All in all, as a light "beach read" It All Began in Monte Carlo succeeds, but if the aim is for a book that just can't be put down — it might be best to look further. Special thanks to guest reviewer Margo Nauert for contributing her review of It All Began in Monte Carlo. Acknowledgment: St. Martin's Press provided a copy of It All Began in Monte Carlo for this review.